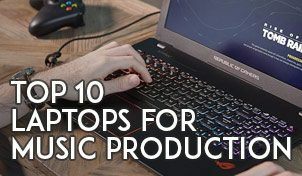 If you make music from your computer, you’ll definitely need an audio interface. An audio interface is a must when you need lower latency, better audio quality, do recording and more options to record. Walk into the music store and you’ll be greeted by sales people who would push you all sorts of audio interfaces from high-end ones to lower end ones. You can however get great recording results using entry level audio interfaces as well, so no matter what your budget is, you’ll be able to find one a suitable interface for yourself. 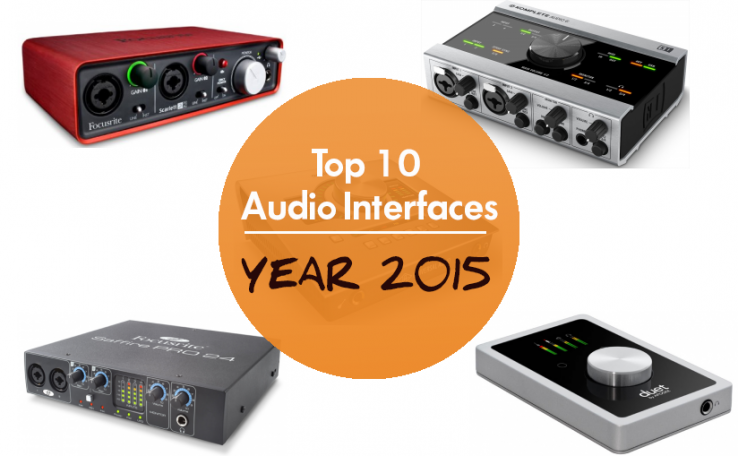 Without any further ado, let’s dive into the top 10 best audio interfaces you can buy on the start of the year 2015. Don’t know much about audio interface? 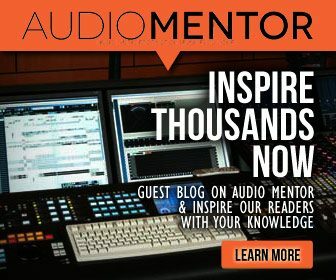 Read the beginners guide to audio interfaces. 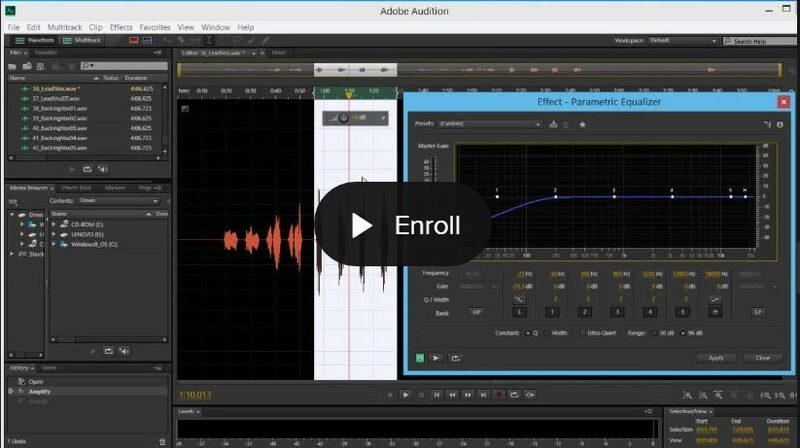 The AudioBox comes easy to setup on your Mac or PC and if you do not have a DAW yet, you can install the bundled Studio One Artist software, though don’t put your hopes too high on a light edition software. The pre-amps are quiet, giving you enough gain levels for professional applications and recording. A two input/ouput USB 2.0 interface with MIDI. giving you the flexibility you need for more production setups. Another favorite audio interface, the Steinberg is a 2ins/2outs audio interface with built in D-PRE microphone preamps and is able to handle audio signals up to 24bit/192khz, which is pretty amazing for an interface of its size and price. Coming in a strong and beautiful metal housing, this interface is made with the touring musician or DJ in mind. There is also a MIDI input at the back of the interface for more versatility. If you are recording your band from home or from your project studio, consider getting the Scarlett 18i20. Coming built wiht 8 Focusrite preamps – which are renowned for its sound and transparency. With two physical independent headphone outs for monitoring, the Scarlett 18i20 in fact goes up to 18 inputs for recording and up to 20 outputs for surround system setup or for different playback/monitoring setups for recording and performance. Something really nice about the audio interface is that it comes with the MixControl software which gives you the ability to slap in effects on your recording and check level meters while recording. As it name implies, the Scarlett 2i2 is a smaller interface for those on a lower budget and do not need the extra inputs and outputs on a bigger interface. Two microphone preamps which sounds great and its ease of setting up will get you recording great sounding vocals and guitars at no time. The monitor dial to adjust the volume is big and easy to reach during tracking. Built in with a 2.0 connection and giving you 2 outputs, the Scarlett 2i2 should appeal to home musicians, singer-songwriters and home studios. Considered a luxury audio interface, this audio interface only works on a Mac. So PC users, too bad, maybe look elsewhere. However, the Duet has gained many good reviews on the sound quality as they claim to have built in higher quality AD/DA converters. The Duet also works on the iPhone and Ipad, so you’ll find it versatile if you’re an Apple fanboy. With a price of at least 3-4 times more than other competing brands, you’d want to get the Apogee Duet for its acclaimed better sound. Our favourite audio interface with the best versatility ever. Built in a hard steel casing with beautiful glass with LED indicators on the top panel, the Komplete Audio 6 is definitely an eye-catcher. The pre-amps sounds neutral with no extra coloration giving you accurate tracking for instruments and vocals. There was hardly any distortion on the pre-amps if any. Unlike audio interfaces like the Scarlett 2i2, the Komplete Audio 6 gives you many routing possibilities that you can find in an interface that size. It features 2 microphone inputs and 2 balance line inputs plus 4 balanced analog outputs where you can output them to things like extra headphone amps or house speakers. 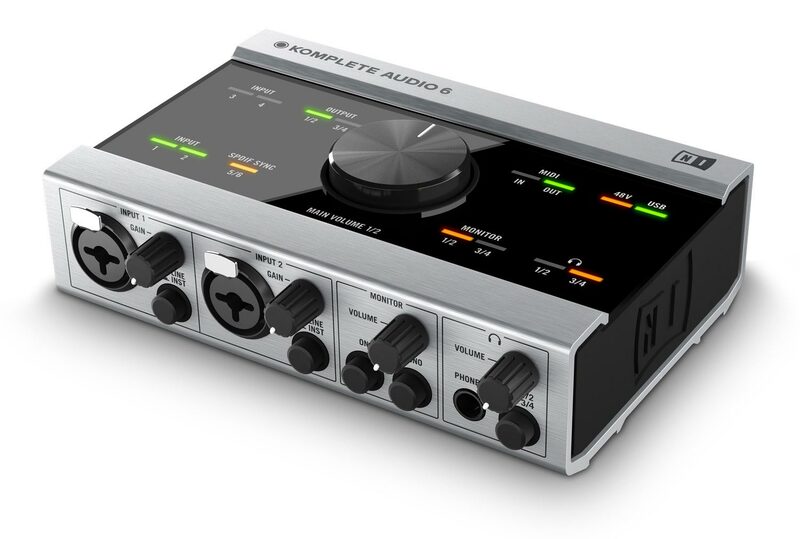 DJs who travel would find the Komplete Audio 6 a nice audio interface. The interface records up to 96khz, not as high as the Steinberg UR22, but that’s all we need really. I doubt many home producers or DJs actually records at 192khz. Prefer to go for the latest in thing and go all the way premium? The Apollo Twin is a premium desktop audio interface made by Universal Audio, one of the pioneers in audio technology, boasting over 50 years of manufacturing expertise. The Apollo Twin however works with a Thunderbolt connection and thus only runs on a Mac. The realtime UAD processing is a highlight for this baby, as it gives you near zero latency even if you’re recording with heavy effects in the recording chain. Great solid product, if you have the cash to spare. Roland is one of the names which many producers look to in the recording industry. A 4 in and 4 uot audio interface that comes with a DSP powered latency mixer which you can control from your computer. You can even insert digital compression on each of the inputs. The interface runs on USB power which is great when it comes to touring. The really nice add-oons you don’t really see on many audio interface is the presence of a ground lift switch. This means if you can lift the ground and eliminate hums if you experience ground loop humming in any place with electrical grounding problems. Sort of the Apogee Duet for Windows, the RME Babyface works on windows & Mac. Very low latency, reliable drivers and yet portable. It comes with a breakout box (see top image) where you connect your analog sound sources to. We’re not big fans of breakout boxes because they look messy and can be prone to damage. Great sound quality with its excellent converters (that is why you’re paying more for this!) use and learn Totalmix, the digital mixer & control panel that you’ll install when using the RME Babyface and you’ll find many great uses to the interface. We love the product design on this audio interface. Balance is a 2in and 2 out audio interface created by Propellerhead, the company that gave you Reason, a DAW which lots of electronic producer favors. 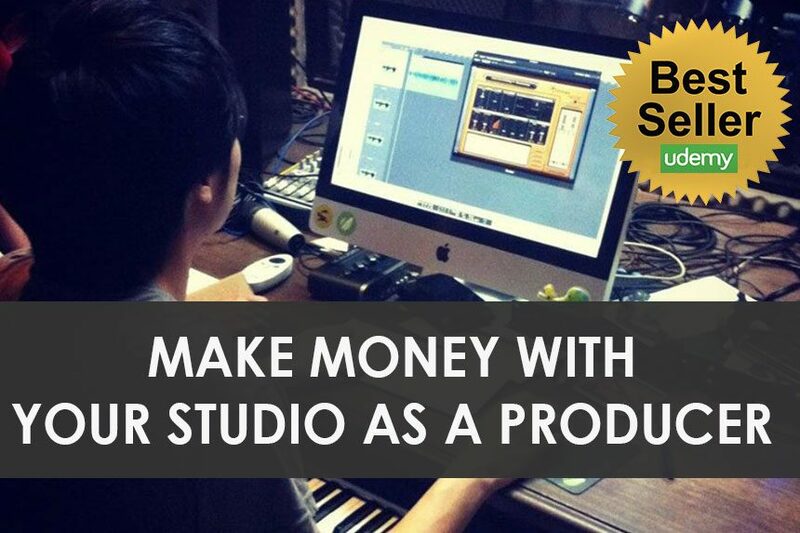 Although made by a software company, the Balance sounds great and it offers ultra low latency. Reason users would find Balance wonderful and a no-brainer to add on to their setup. There is a ‘clip safe’ function on the interface where once enabled your recordings won’t be recording clipped. Pretty clever.